While when we think of the art of ancient Rome we tend to connect it to the influence of Greek art, there was a strong naturalistic trend in Roman art that would have appalled Greek artists. True, the Romans admired, and began pilfering, Greek art as early as 212 BCE when they sacked the Greek trading city of Syracuse, Sicily. This pilfered art decorated public buildings and the homes of wealthy Romans. However, Romans preferred extreme realism when it came to portraiture, even of emperors and their families. Interestingly, artists were not a respected class in Roman society as they were in Greece. Therefore, very few, if any, Roman artists’ names have come down to us through history. While Greek artists stressed idealized, physical perfection of the human figure, Roman artists did not share the idea that physical perfection reflects the divine. Romans were scornful of the luxurious ease of the Etruscan and Greek societies. They were proud of their austere virtues and military valor. This glorification of their military past is reflected in an overall ancestor worship that manifests itself in portrait sculpture starting in the Republican period. Prominent Romans commissioned wax portrait heads, often death casts, of ancestors that were displayed in public processions. Carved and modeled portraits are based on these wax heads, none of which have survived. 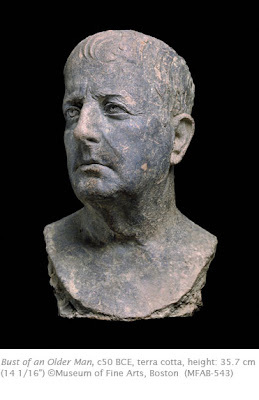 Greeks produced portrait busts rather than heads as they felt portrait heads resembled a decapitation. Typical of Roman Republican portraiture is a striving to render the person’s features with a map-maker’s faithfulness to the features. This maintained the air of simplicity stoutly espoused by even the wealthiest citizens. This is evident in this late Republican bust of a middle aged man. His thinning hair, sagging jowls and wrinkled neck would have appalled Greek artists. However, the Roman artist has managed to instill a sense of dignity to the sitter. Despite the emphasis on extreme realism, however, there is a psychological reserve that clearly puts this genre outside of any Greek influences, particularly works from the Hellenistic period. Roman art in the Louvre museum in Paris.